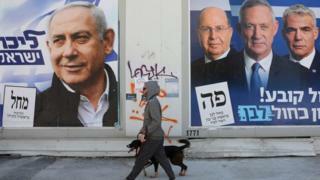 Israelis head to the polls on Tuesday for a general election in which Prime Minister Benjamin Netanyahu is fighting for his political survival. Here are five things to know about the contest, and what to expect. Benjamin Netanyahu is running for his fifth term in office. If re-elected, he will overtake Israel's founding father David Ben-Gurion in July as the country's longest-serving prime minister. However, Mr Netanyahu is facing both serious corruption charges, pending a final hearing with the attorney general, and his toughest competitor in years - Benny Gantz. Mr Gantz, a former chief of staff for the Israeli military who is a newcomer to politics, can rival Mr Netanyahu on security - one of the election's key issues - and promises cleaner politics. His centrist Blue and White alliance - formed with two other former military chiefs and the former TV anchor-turned-politician Yair Lapid - was initially doing slightly better than Mr Netanyahu's Likud party in opinion polls, although the situation has since reversed. The close race is leading to an aggressive and often dirty election campaign with lots of smear attempts. Israeli voters tend to decide who to support on the basis of the candidates' personalities, rather than their policies, and whether they consider them strong leaders. Some polls suggest that Mr Netanyahu is more likely to be able to form a coalition than Mr Gantz because of the prime minister's close relationship with other right-wing parties and religious parties. Recent weeks have seen tensions flare between Israel and Palestinian militants in Gaza, and US President Donald Trump is expected to publish his plan to solve Israel's long-standing conflict with the Palestinians soon after the election. However, ways to revive the moribund peace process have not been a main subject of electoral debate. The Israeli public sees little hope in the long-standing international formula for peace - the "two-state solution". Benny Gantz's alliance also calls for continued control over the Jordan Valley and retaining West Bank Jewish settlement blocs. Settlements are seen as illegal under international law, although Israel disagrees. Israel's Labour Party, which sealed a breakthrough peace deal with the Palestinians in the 1990s, has lost favour with voters. Israel's religious Haredi population is over a million-strong. Traditionally, ultra-Orthodox Jews of European descent and those of Eastern descent have taken advice from their rabbis and voted for dedicated parties.